Each year, we commemorate Shabbat Chayal by making a Kiddush and choosing a Tzedakah tied to the IDF to give our support. This year, we will mark Shabbat Chayal by raising money for Lev LaChayal, , The Yeshiva Center for Lone Soldiers in the IDF. he Sisterhood Book Club will meet to discuss Two She-Bears, by Meir Shalev. The Men’s Club is once again selling wine for the chagim. Orders are due by March 10, with delivery of orders of over $100 (pre donation) on March 24 (Teaneck only). Please send your orders to Moishe B. Singer, 170 Edgemont Place, Teaneck, NJ 07666. To receive our special pricing, all orders must be accompanied by a 12% donation to the Men’s Club. Thank you for supporting our shul! You can also e-mail your orders to mensclub@bethaaron.org and pay via the papay donation form. Click here for the wine sale list. We will be holding our annual wine tasting on March 3 from 8-9:30 at the shul. Mazal tov to Ari Mandelbaum for winning the 2013 chulent challange. that we are turning Friday night from the ordinary to the extraordinary. Get involved with the FNBA committee. 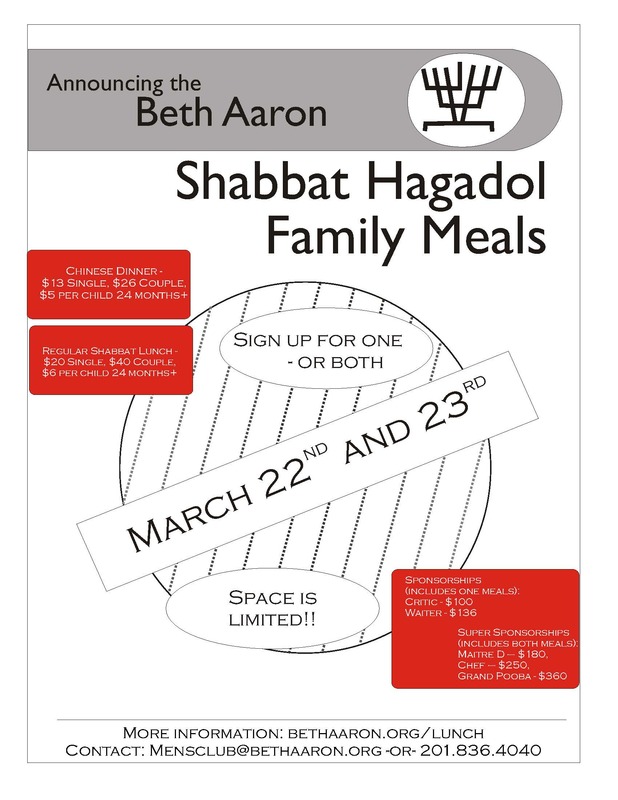 e-mail FNBA@bethaaron.org for more details. Help us run more onegs. Sponsor today.